I think I don't use my Conid as much because of the selection of Bock nibs. I have a couple of mediums, had to break arms to get a broad -- and of course I prefer something in a stub or a 1 mm italic. I just cant seem to source these nibs for my Conid. Many say you can use the Jowo 6, but I don't think it's a perfect fit. If one can use Jowo in Conids Horray! - but what's the definitive answer? And what about the great places to source Bock nibs? Thanks all - enjoy your Conids. I'm saving for another. I have two Conids (a third is on order), both currently wear titanium Stubs. The nibs were all done by Conid. The Kingsize which was my first came with a Gold Fine point and I just never really liked it. When I placed an order for my Ebonite Regular I also ordered a Medium Titanium Stub for the Kingsize. The regular came with a Broad stub. Both of these are fantastic, in fact the regular is my favorite pen! The one on order will also come with a Broad Stub. My experience is that Conid will grind a nib as you like. I may have seen someone specially request a Jowo feed from Conid but that may be more effort than having Conid just do a stub. When you order the pen you have the ability to have them customize the nib to whatever you want. I'm from Beaufort Ink - can I help here at all? Bock nibs will screw straight into Conid pens as a direct replacement, and we have them in stock in EF, F, M and B, in all sizes, as well as 1.1, 1.5 and 1.9mm calligraphy nibs. They will also be in stock on BB from about the end of this week. So, if you are ordering a new Conid, yes, I believe they will customise the nib for you, but if you already own one, actually you have a far greater choice than you previously thought. Top quality nibs, ink and refills, pen kits, tools and supplies for discerning pen enthusiasts and makers. Thanks so much. That's what I wanted to hear. I have a standard Conid, what Bock nib size would that be? Probably a #6? Many thanks. Edited by Bill Wood, 26 September 2017 - 19:59. Bill, I'm not sure which of their models you regard as standard. The Slimline takes a size 5, the King Size takes a size 8, and the Minimalistica, Regular and Giraffe all take a size 6. Thanks Phil - I'll be ordering. I have or rather had a Bock Titanium Fine nib that was perfect.. I just messed it up by catching it on the CAISO when I put my cap back on. Sigh.. it'll have to go back to Conid for a fix. Edited by SpecTP, 17 November 2017 - 19:17. Yikes – is it easy to catch the nib on the CAISO system? it's not easy.. but if you don't pay attention, you won't notice it until it's too late. you just need to insert the cap at a slight angle to avoid the contact. I was just in a hurry. The definitive answer......... here it goes. You can use a N6 Jowo in a bock feed. 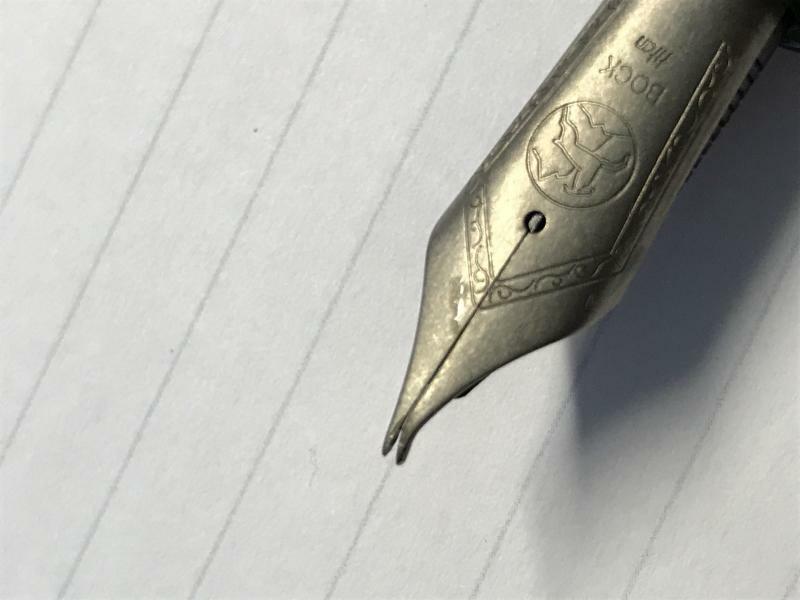 It should work, but the opposite is not possible, well, you'll have problems to adjust the nib correctly, this is a bock on a jowo feed, as the feed that's used by jowo is wider, and Bock nibs are a bit narrower than the Jowo ones.....what else, just buy a steel nib and make the try. think htat the nib casings are different, so your conid has a bock case. Here a link to a german retailer of Bock. it has a good selection of nibs. I speak german so for me is no problem, but you can always use google translator, Im giving you the link. You can also write to Francis or Werner, they will be more than happy to help. You can buy nibs at FPNibs this retailer is based on spain and carries Jowo, prices are good. I think you can try a 14k N6 probably will be something in between. But always use the bock feed. In general european retailers are cheaper than american ones, goulet pens and american sites of the sort are selling re-branded jowo nibs very expensive. PD jowo has no titanium nibs.